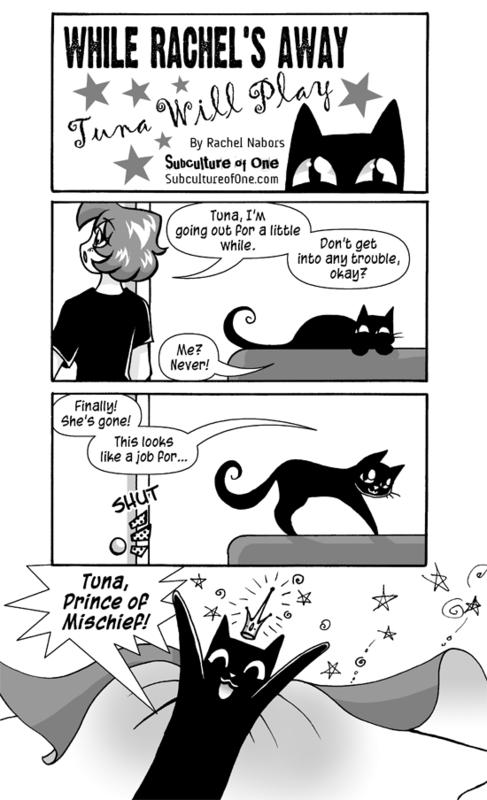 “Tuna, Prince of Mischief” is a play on “Tibert, Prince of Cats,” a character from medieval “Reynard the Fox” tales, referenced by Shakespeare’s Mercutio in Romeo and Juliet as an insult to the main antagonist and similarly named character Tibalt. Tuna has always been the Prince of Mischief–and cats! I have a black kitty. His name is Tybalt, Prince of Kittens! There is a black cat that lives in my house, I dont have a name for her other than Ms KittyKitty, I only see her at meal times and when it is time to change the litter. She is NOT my cat, nor am I her human, and I dont much care for her at all, but she wont leave my house. I have a Peekapoo dog and she amuses herself and me by chasing the cat around the house. The Dog sleeps in my bed and shares cuddles with me, the cat eats my food and doesnt like to be touched. Since we’re on the subject of cats, my cat is evil. She mauls me regularly.